Players are expected to participate in the guild on their Main Character. We're a heavy roleplay guild, and we collaborate on stories together. Every PC is important to the story of the guild and in the stories of other characters, so we appreciate a player's dedication on a main character for story continuity. A member can have as many alts in the guild as they like, as long as they have a main character in the guild. Players are expected to act with kindness and patience (i.e., don't be a jerk). Life is a group project. You don’t have to know or even like everyone in the guild, but you do need to have the maturity to roleplay responsibly within our stories. 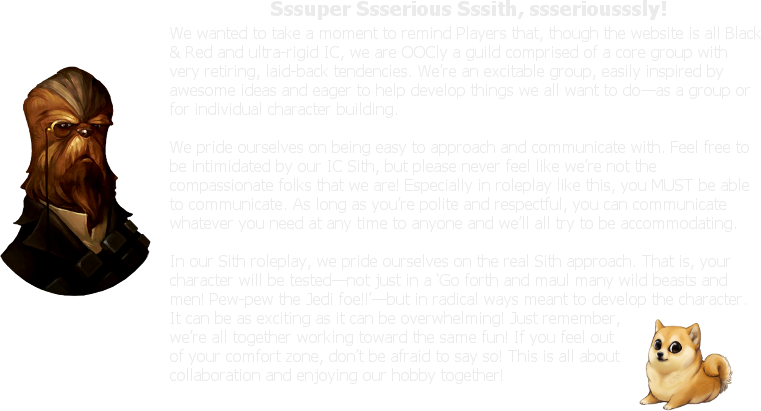 We have all come together to play our hobby and collaborate on great roleplay! Never forget that we’re all normal folks just trying to relax and have some creative fun. If an issue arises, try to resolve it through communication, or come to an officer for mediation. It will be handled in a calm, logical, and non-judgemental fashion. We will not tolerate the act of trolling, spamming, bullying, flaming, or other malicious and mischievous disruption. This includes in-game, and on the forums. Such behavior is a poor reflection on yourself and the guild. Self-control is preferable. Players will be held accountable for actions performed under the influence of drugs or alcohol, no exceptions. If you break a rule (or do something equally irresponsible) while under the influence, you will receive the same treatment as if you had broken the rule while sober. Communication is the key. The core of the group is comprised of individuals who aren’t afraid to express what they need to in order to ensure they can have fun comfortably. Players will get along best with this group who aren’t afraid to communicate their feelings, needs, and ideas but are also kind, patient, and polite in doing so. We are here to collaberate. It is no one-person's "job" to create and provide rp content to you or the guild. We are all creative and passionate about our hobby, and we will all come together to create great rp! No one is entitled to the hard work of another. Creating rp content is a responsibility that belongs to everyone. Discussing IC things OOC. Let's keep this at a minimum as well. Discussing what our character is feeling, what they were or are thinking during an rp, or what they may do with another player who's character is involved in the rp can result in emotional escalation and debate. Keep it IC! Roleplay is required within the guild. We are a heavy roleplay guild with in-depth stories. We work hard to weave character stories throughout the guild campaigns. Thus, your character will influence and effect other player characters in significant ways, and you will be expected to responsibly participate. If you wish to withdraw from a story for any reason, an IC path should be constructed with the other PC's in mind. Communication is key! There are things even we won’t do. Dark roleplay is a common theme in the Adumbrate and within the Sith culture. However, there are some lines we don’t cross, including but not limited to: child abuse, child molestation, sexual torture, sexual mutilation, etc. If you are engaging in torture/violence roleplay with someone else, we enforce a consent rule, meaning you must have OOC permission to pursue that roleplay. Violators of this rule are removed from the guild immediately. The guild calendar keeps a current listing of our events. Members are encouraged to use the calendar freely to schedule their own events. Guild bank: If you need something from the guild bank and don't have access, just ask! Absences: If you go missing for a month without prior communication, you'll be removed from the guild. If you are still in the initiation phase, this becomes two weeks. You must be 19 or older to join the Adumbrate. You, the Player, are not your Character. We roleplay with OOC courteousness. Meta/PowerGaming & Godmodding are disallowed. Antagonism is an IC storytelling device. IC Relationships are IC storytelling devices. Every IC action or decision has IC consequences, for better or worse. Character Agency is the backbone of rp! The Player is ultimately responsible for his or her own rp happiness.